This Friday, October 16, instead of our usual monthly video meeting at Hooked on Colfax coffee shop, we’re inviting you to attend Yankee Tavern, a play now running in Denver in which 9/11 Truth plays a significant role. We've secured special 2-for-1 ticket prices for Colorado 9/11 Visibility members for one night only. Who needs a video when you can go see a play? WHEN: Friday Oct 16, 8:00 p.m. COST: Three ticket options: $18/$34/$42. 2-for-1 ticket pricing available on the $34 and $42 seats, this show only, details below. 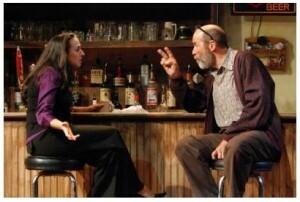 "Yankee Tavern" is a political thriller by playwright Steven Dietz, who resides in Austin. The Denver production is part of a "rolling premiere," the third in a series of separate local productions of the play in the US this year. It runs Sept 12th to Oct 24th at the Curious Theatre in Denver. From the Curious Theatre brochure: "From Denver native Steven Dietz comes a new play filled with mystery, conspiracy and thrills. Set in a crumbling tavern in New York City, a young man is saddled with questions about his father's best friend, their mysterious past, and a stranger who knows much more than he should. In an instant, outlandish hypotheses become dangerous realities as surprising revelations continue to emerge in this eye-opening look at our government and the theories that have shaped our country." The story unfolds at an old watering hole in lower Manhattan, where an eccentric and entertaining character named Ray, who fits the stereotype of a "wacky conspiracy theorist," holds forth with 9/11 Truth, including details of the collapse of WTC7, not hit by a plane. Then a mysterious bar patron named Palmer turns out to be more than a talker--he played a shocking real-life role on 9/11. And the owner of the bar, Adam, has some very real 9/11 intrigue unfolding in his own life. Janet, Adam's fiancee, is the emotional center of the film, sharing a depth of feeling that will surprise you as events unfold. Dietz doesn't make 9/11 Truth the point of the play, so don't expect the audience to come away necessarily persuaded. After all, Ray is not the most effective messenger with his highly charged delivery, and he undermines his own credibility by seeing conspiracies everywhere, including the 1969 moon landing, corporations making people sick to sell more Kleenex, and even the institution of marriage. Said Dietz, "I had no interest in doing a 9-11 rant, and I didn't want to do a conspiracy theorist rant. I wanted to use those things as a backdrop for a specific story about these people." But the play is superbly written and acted, and slips a great deal of 9/11 Truth to the audience against a dramatic backdrop. And the Palmer character directly undermines the official story. So bring your friends and let's have a great turnout to support local theater, especially when the storyline involves 9/11 Truth! After the play, members of the cast will bring chairs out on stage and engage the audience in a "Talkback" where there will be a chance to share thoughts and feelings and dialogue with the cast. Each "talkback" has its own theme, and the theme for October 16 is "2012/The End of Days." Click for Bob Bows' review in the Denver Post and photos from the play. 2 for 1 Tickets! Offer available on regular priced tickets in Price Points A and B (tickets regularly $34 and $42), valid Friday, October 16. Use Code: 911TRUTH (in ALL CAPS) in the Discount Code box online during checkout at the Curious Theatre website or by calling the Box Office at 303.623.0524. Advance purchase is recommended as seating is limited at this small theatre. Our regular Denver monthly meeting at Hooked on Colfax will resume Friday, November 20. See you at the Curious Theatre! Joe on Tue, 10/13/2009 - 4:12pm. 9-11 Truth in the arts! Love it! I wish I were in Austin. bbruhwiler8 on Tue, 10/13/2009 - 4:53pm. Douglas Hilton on Tue, 10/13/2009 - 8:20pm.